An air race from London to Paris provides the premise for this marvelous comedy, which features thrilling aerial photography and some stupefying stunt flying. It’s set in 1910, when the (lovingly re-created) airplanes of the period were likelier to sputter and crash than they were to go in a straight line. The international contest requires an international cast, including Stuart Whitman as a cowboy American interested in the ladylove (Sarah Miles) of an English ace (James Fox). Alberto Sordi and Gert Frobe represent the Italian and German nations; Terry-Thomas plans frightful sabotage for race day. This extraordinary comic version of the historic 1910 London-to-Paris air race features the greatest aviators from around the world. They all come together when a stuffy, but very rich, newspaper publisher decides to sponsor an airplane race across the English Channel. Convinced it will give his newspaper worldwide publicity, the publisher offers 10,000 pounds to the winner. The escapades between the American, British, French, German, Italian and Japanese teams result in the most darling and hilarious in-flight acrobatic stunts ever caught on film. 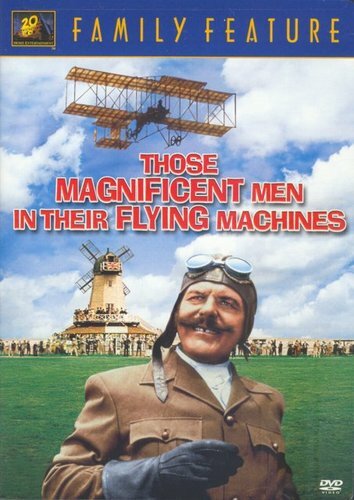 But the film’s greatest triumph is the amazing re-creation of the vintage airplanes which did the actual flying. The beginning and ending sequences marked the final feature film appearances for Red Skelton. According to the book “Creating the Filmation Generation”, Filmation was interested in producing an animated series based on the film, and held a presentation in 1969 with art inspired by Ronald Searle’s opening titles. The concept failed to sell, but that same year competitor Hanna-Barbera debuted a similar show, Dastardly and Muttley in Their Flying Machines (1969).